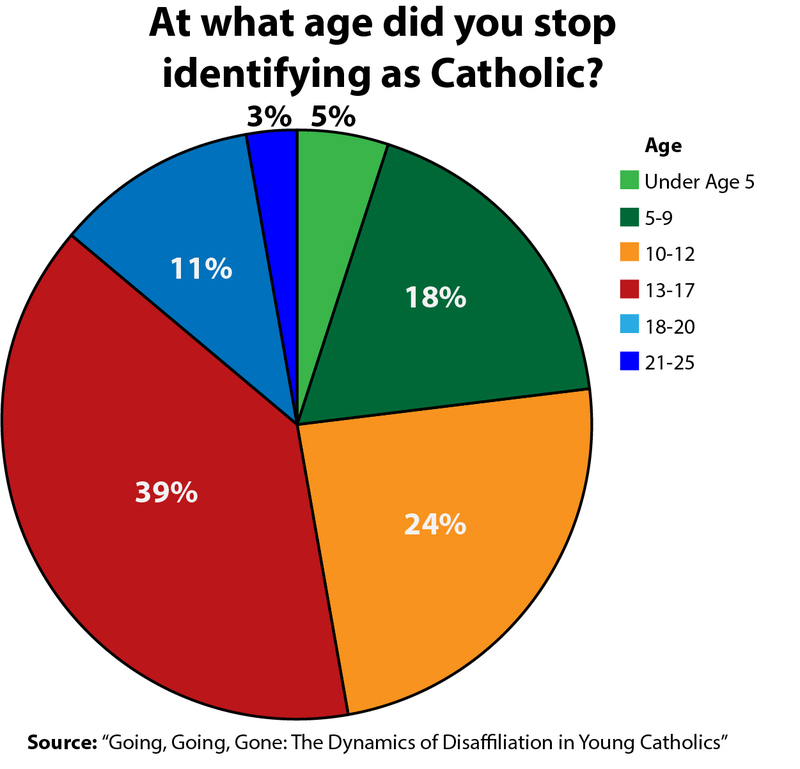 The new study — “Going, Going, Gone: The Dynamics of Disaffiliation in Young Catholics” — is a wake-up call for all Catholics, not just for people involved in youth ministry. Based on interviews with young Catholics, the qualitative research project explains how they became disaffiliated, mostly over time, with feelings of having the faith thrust on them as children, of somehow being alienated or of being a good person without the ‘burden’ of religious rituals. They also might outright reject the Church and its teachings, or have doubts because their questions about the Catholic faith haven’t been answered adequately. Whatever the reasons — and there many — Catholic adults not only need to pay attention and humbly listen to the young people’s stories but also ask questions of themselves. “What’s the grace that the ‘disaffiliated’ are bestowing on the Church; what is the Holy Spirit saying to us as pastoral leaders with these stories from young adults?”asked Bob McCarty, project coordinator for the Saint Mary’s Press study, in collaboration with CARA, the Georgetown-based Center for Applied Research in the Apostolate. Perhaps we see ourselves; that we can and should do a better job in being examples and passing on the faith. Catholic education and youth ministry only go so far. The faith of our youth is only as strong as the foundation of Catholic families on which it is built. Disaffection happens, on average, at the age of 13, according to the study; so youth might have checked out before even entering high school. That means that family looms large in the faith of our youth. Last year, when students at Our Lady School in Festus were asked how their parents could help them prepare for Confirmation, one of their answers was simply, “to take them to Mass” on Sunday. It’s more than “having” to go to Mass; it’s fully participating, doing it with joy and a smile. Being a better Catholic starts at home; that’s the foundation of the faith for our youth. Parents need to pay attention, listen and be present, and serve as good role models. They need to answer difficult questions when asked, to lend a sympathetic ear when children or youth express doubts. Everyone has doubts; even the great saints had doubts, as well as priests, seminarians, religious and regular lay Catholics. That’s normal. Some of the “disaffiliated” may never return to the Church, but it’s incumbent upon us to listen and understand how and why they became disaffiliated. Then, and only then, we as a Church can meet the challenges disaffiliation present.